AGELESS Skincare products prevent and treat the signs of ageing and environmental exposures. IMAGE Skincare’s highly effective anti-ageing skin care products utilize AHA blends, nutripeptides®, retinols, lightening agents, and antioxidants to produce ageless skin. Skin that looks aged, photo damaged, pigmented, dull, or tired will be rejuvenated with the use of these anti-ageing skincare products. My signature Face Lift results-driven treatment will change the IMAGE of your skin in just one session. Vitamin C, Alpha and Beta Hydroxy Acids, and gentle yet effective enzymes speed up cellular turnover lightening, tightening and brightening all skin types; even Rosacea and sensitive. 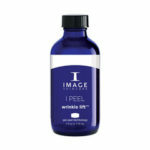 This peel for wrinkles contains an ultra-resurfacing blend of Glycolic and Retinol that visibly reduces the appearance of fine lines and wrinkles, leaving the skin firm and revitalized. This potent chemical peel for acne blends Alpha and Beta Hydroxy Acids and contains anti-inflammatory agents to effectively treat and heal acne lesions. A Professional course of skin treatments and products helping to reduce acne and acne scarring. All Image products are available to buy through Jill at competitive prices. Call 07527 332977 for details of prices. For more details visit www.imageskincare.com or www.renaissance-skincare.com.